BFUHS Question Papers 2017: The BFUHS sample papers is now ready to download in our examlevel website. The UG & PG medical course students who going to appear in the upcoming semester have to know examination pattern. So we advised to download the BFUHS old question paper from any recognized site. If you want to know more tips about the examination, then read this article fully. 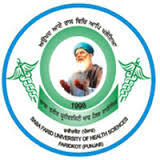 In the official Baba Farid University of Health Sciences site, they attached the model/ sample papers for past five years (2013/ 2014/ 2015/ 2016/ 2017). It will help you to prepare well by comparing the year wise question papers. After downloaded the question paper, extract the ZIP file. Then only you can able to view the BFUHS part 1, part 2, part 3, part 4 question papers file. The 1st, 2nd, 3rd & 4th year students from B.Sc Nursing, B.Pharmacy, M.Sc Nursing, M.Pharm, BDS, GNM, MBBS, MDS, BPT who looking for the BFUHS model question paper 2017, are advised to download it from our authorized site. Here, we attached the BFUHS previous year question paper in as RAR format. Each file holds the past five years question papers as course & subject wise. Every academic year, the University has been conducting the even semester (2nd, 4th, 6th) in May/ June and odd semester (1st, 3rd, 5th) in Nov/ Dec month. After conducted the exam, the question papers will be uploaded on their digital website and also the hard copy will be placed in the central library of Baba Farid University of Health Sciences. For further updates, keep touch with us. First go to the official University site (www.bfuhs.ac.in). Then visit the tab called 'Download ---> Question Papers'. Select the course, department and year. It will show the available question papers in as Zipped file. Choose your required file and click over it. Finally BFUHS question paper will download automatically as RAR format. NOTE: If the server is not working properly, then immediately contact our admin or leave a comment below. We will clarify the problem and help you to solve it quickly.